Happy New Year! I hope all of you had a happy and healthy holiday season. If you did as much celebrating, eating and drink as I did over the last few weeks you’re ready to start the new year on the healthy side! It’s easy to reach for comfort food when the weather is cold but there is no reason that comfort food can’t also be healthy! 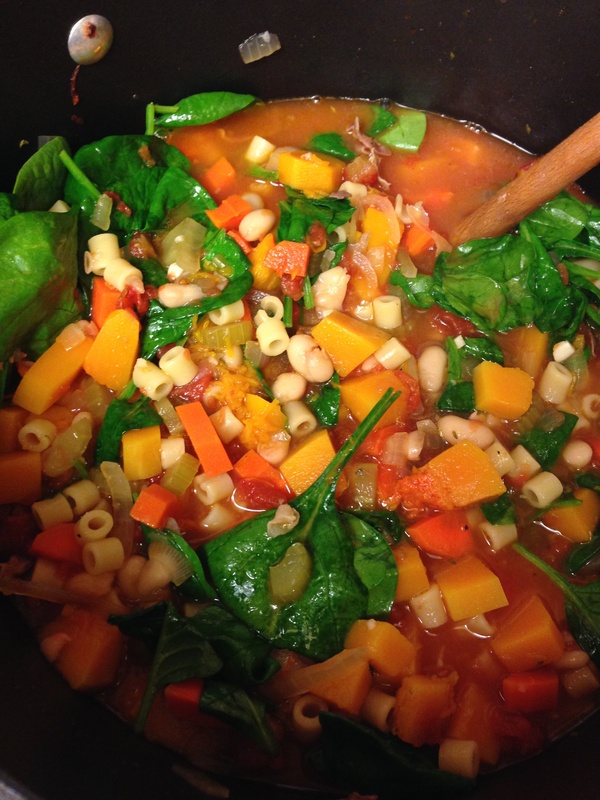 Like this butternut squash minestrone! This soup can easily be made vegetarian by leaving out the pancetta and substituting vegetable broth for chicken broth. The butternut squash gives this soup a hearty and filling base while adding a touch of sweetness. Fresh spinach adds some color and leaves you feeling like you’ve eaten your greens for the day! Perfect for dinner, lunch or apres skiing snack, everyone will love this soup! Cheers! Heat 2 tablespoons of olive oil over medium heat in a large, heavy pot or Dutch oven. Add the pancetta and cook over medium-low heat for 6 to 8 minutes, stirring occasionally, until lightly browned. Add the onions, carrots, celery, squash, garlic, and thyme and cook over medium heat, stirring occasionally, for 8 to 10 minutes, until the vegetables begin to soften. Discard the bay leaf. Add the beans and cooked pasta and heat through. The soup should be quite thick but if it’s too thick, I add more chicken stock. Just before serving, add the spinach, and toss with 2 big spoons (like tossing a salad). Cook just until the leaves are wilted. Stir in the white wine and pesto. Depending on the saltiness of the chicken stock, add another teaspoon or two of salt to taste. Sprinkled with Parmesan cheese, drizzle with olive oil and serve hot with fresh bread. 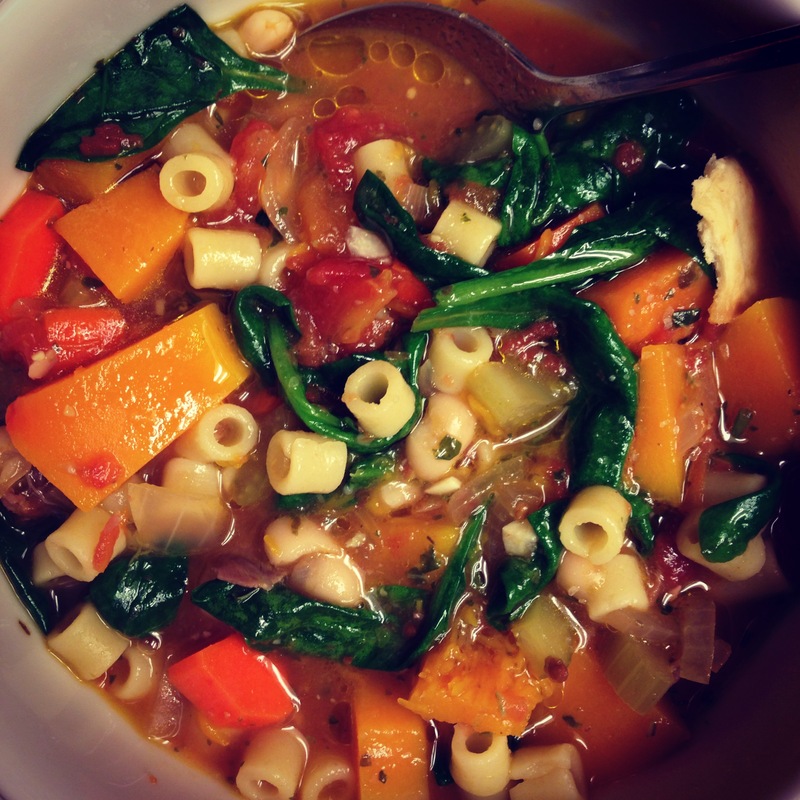 This entry was posted in Recipes, Soup, Uncategorized and tagged Butternut squash, butternut squash minestrone, minestrone, Soup by skibootsinthekitchen. Bookmark the permalink. This looks healthy and amazing. I’ll have to give it a try. Healthy, amazing and super delicious! Enjoy!! I made this exact same recipe tonight! One of our favorites!